Curious about virtual reality? Join us at Do Space from 3:00 – 6:00 pm on Thursday, August 23rd, for a special Virtual Reality Open House event! Brought to you by our friends at Great Plains Communications, the event will feature refreshments and virtual reality (VR) activities including demonstrations on our brand-new HTC Vive system. You’ll be exploring a virtual world in no time! The HTC Vive is a complete, room-scale VR experience. Its 15′ x 15′ stage allows players to walk around, duck, or lunge in the virtual world, fully immersing themselves. Event attendees can choose from a selection of popular Vive games, including The Lab and Tilt Brush. In Valve’s The Lab, you can fix a robot, build a castle, adopt a virtual dog, dodge asteroids, and much more. For the artistically inclined, Tilt Brush will allow you to paint in 3D. Recommended for ages 11 and up, each demonstration will last about 10 minutes. Time slots are available on a first-come, first-served basis, so please plan accordingly. There will be a sign-up sheet in our Active Learning Lab, so feel free to enjoy other event activities instead of waiting in line. Can’t make the Open House? 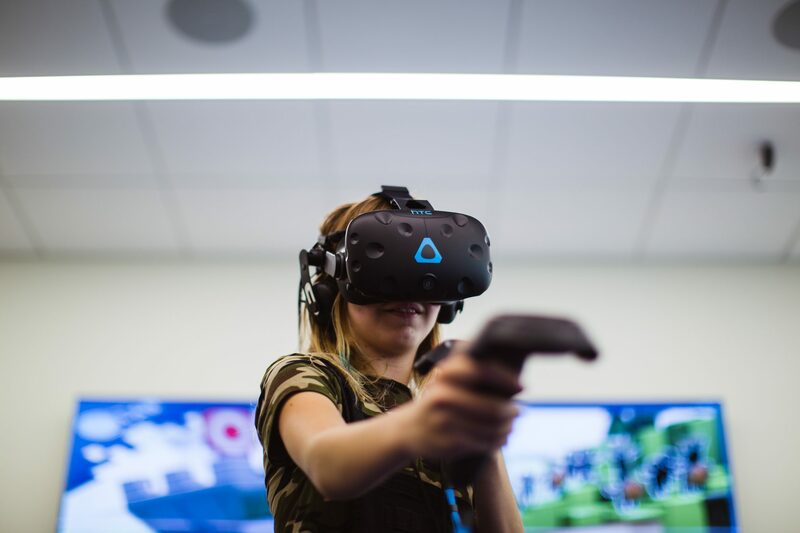 Throughout the month of August, Do Space is offering open HTC Vive demonstrations every Monday night from 6:30 – 8:30 pm. Hope to see you there! Do Space’s HTC Vive virtual reality system is generously sponsored by Great Plains Communications. Thank you! Danielle is a Community Learning Specialist at Do Space who was born and raised in the Omaha area. In her free time, she can usually be found playing video games or reading.